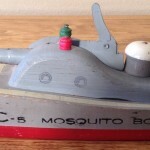 This is a C-5 Mosquito Boat that measure 9.5″ x 3″. The boat is part of the #671 Battle Fleet set that was in introduced in the 1942-43 catalog. There is a small gap in the center of the boat that allowed a rubber band through to hold a torpedo to either side of the upper deck. In the same catalog the #201 Shooting Battleship that is the same size but more simplistic in design was renamed the Shooting Mosquito Boat. The designation on the side of the #201 stayed C-5 U.S. Coast Defense though. So now there are two different boats that look different, with different model numbers, that are called by the same name. To this point I am not aware that the Mosquito boat was ever issued individually, only as part of set #671.